What it confirms: Global central banks are ever so slowly losing their appetite for being over-exposed to US-dollar-denominated assets, though they’re not dumping them from their foreign exchange reserves; they’re just tweaking them. In Q2 2018, total global foreign exchange reserves, in all currencies, rose 3.2% year-over-year, to $11.48 trillion, well within the range of the past three years. For reporting purposes, the IMF converts all currency balances into US dollars. The euro became an accounting currency in the financial markets in 1999, thereby replacing the former European Currency Unit (ECU). Euro banknotes and coins appeared on January 1, 2002. 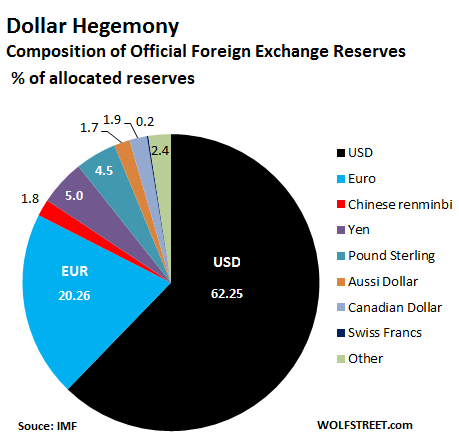 At the end of 2001, the dollar’s share of reserve currencies was 71.5%. In 2002, it dropped to 66.5%. By Q2 2018, it was down to 62.25%. In Q2, the Euro’s share edged up to 20.26%, the highest since Q4 2014. 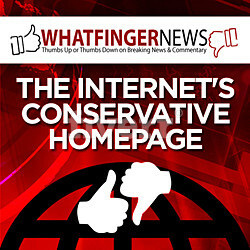 The creation of the euro has been the most successful effort to reduce the dollar’s hegemony. Before the Financial Crisis, and the euro Debt Crisis, the theme in Europe was that the euro would reach “parity” with the dollar on the hegemony scale. But this talk fizzled out during the euro Debt Crisis. 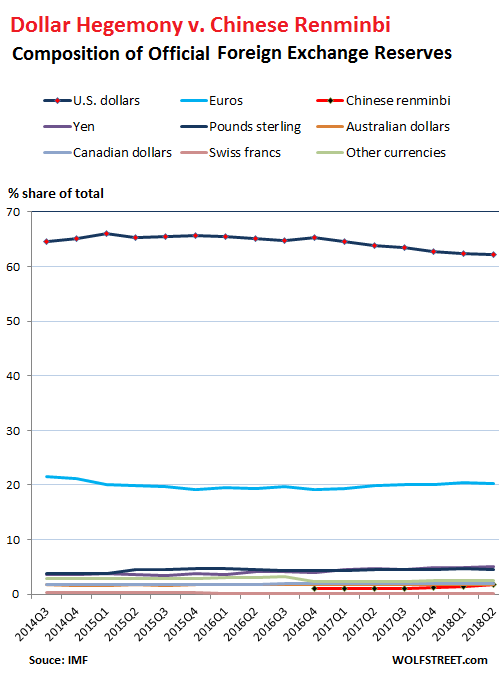 The latest effort at whittling down the dollar’s hegemony is the elevation of the Chinese renminbi to a global reserve currency, as of October 1, 2016, when the IMF added it to its currency basket, the Special Drawing Rights (SDR). The RMB’s gains make “glacial” appear lightning fast. In the chart below, the RMB is the thin red sliver with a share of just 1.84%, but this is up from 1.39% in Q1, and up from 1.2% in Q4 2017 – minuscule, considering that China is the second largest economy in the world. It seems, central banks remain leery of holding RMB-denominated assets, but they’re beginning to dabble in it. Note the Swiss franc, the barely visible black line in the pie chart above. It has been in the 0.16% to 0.18% range since Q1 2016, but that’s a sharp drop-off from its share in prior years. All these percentages denote the currencies’ share of “allocated” reserves. 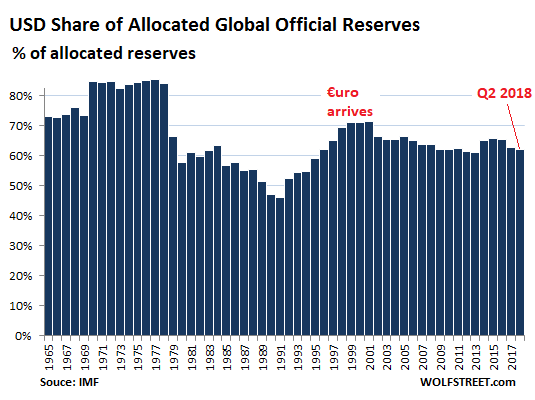 Not all central banks disclose to the IMF how their foreign exchange reserves are “allocated” by specific currency. But over the years, disclosure to the IMF has increased. In Q4 2014, “allocated” reserves accounted for 59% of total reserves. By Q2 2018, this has risen to 91.6%. In other words, the COFER data is getting more complete. A word about the relationship between the dollar as the top reserve currency and the huge trade deficits the US has with the rest of the world: There is a theory that says that the US, as the country with the top reserve currency, must have a huge trade deficit with the rest of the world. What pulls the rug out from under this theory is that the Eurozone, which has the second largest reserve currency, has a large trade surplus with the rest of the world. However, the status of the dollar as the top reserve currency and top international funding currency allows those trade deficits to be financed and thus makes those trade deficits possible over the longer run (going on two decades now).